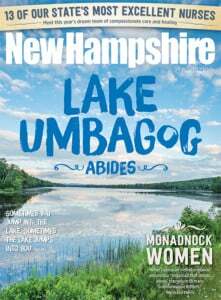 Every month New Hampshire Magazine readers send me images of family heirlooms and objects that they have questions about. It is always fun to hear the stories and evaluate these treasures. This month I am sharing with you a treasure of my own! Send a photo to bcoles@nhmagazine.com. If there are markings, please take a clear photo of them as well. If your submission is selected, we'll have expert Jason Hackler appraise it. Hackler, manager/owner of New Hampshire Antique Co-op in Milford and partner of Jason Samuel Antiques, is a past officer of the Granite State Antique and Appraisers Association, a principal of the Active Appraisal Group and a member of the N.H. Antique Dealers Association. Fifteen years ago, at the seemingly invincible age of 25, I was at an estate sale and purchased for $450 a large terracotta sculpted relief tile signed by the noted American ceramist Paul St. Gaudens (1900-1954). I loved the piece as I have long been a fan of the Cornish Art Colony and its founder, the famous American sculptor Augustus Saint-Gaudens (1848-1907) who was Paul St. Gaudens' uncle. This was a chance for me to own a great object that was a created by the nephew of one of the most celebrated sculptors in American history. Pretty cool. Born in Ohio in 1900, Paul St. Gaudens was an accomplished potter and ceramist who studied in the United States and abroad. Inspired by his supremely talented uncle, Paul came to the Cornish Art Colony in Cornish, NH, to sculpt. There he began experimenting with pottery with renowned W.P.A. artists William and Marguerite Zorach. (The post office in my hometown of Peterborough features a Marguerite Zorach W.P.A. mural – I urge you to visit.) Paul continued his work in ceramics and maintained studios both in New Hampshire and Florida. This particular tile was made in his Coconut Grove studio. I had this tile proudly displayed in the kitchen in our last house; since the move it has been safely packaged and subsequently forgotten in my closet. A few weeks ago I was reminded to take it out again after attending an engaging lecture about Augustus Saint-Gaudens at the Peterborough Town Library. The lecture was presented by Dr. Henry Duffy, curator at the Saint-Gaudens National Historic Site. After the lecture, I spoke with Dr. Duffy and told him about my Paul St. Gaudens tile, which he was eager to see. Upon receiving images I later e-mailed, he commented that this tile was one of a pair, or possibly a series, by Paul St. Gaudens. Often I have toured the Saint-Gaudens National Historic Site in Cornish (which I also urge you to visit) and have enjoyed walking the beautifully landscaped grounds; however, my main interest is in exploring the house museum and seeing Augustus' personal collection and décor to understand the artist more. This national park is a New Hampshire treasure not to be missed. I would estimate this Paul St. Gaudens ceramic tile at $2,000.